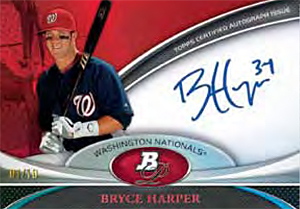 2011 Bowman Platinum Baseball is back for the brand's second season, boasting a slew of prospect autographs including several signed cards of Bryce Harper. Each 20-pack hobby box of Bowman Platinum will yield 2 prospect autographs and 1 patch autograph. 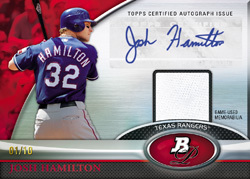 Every 12-box case will include one multi-auto card and USA Baseball on-card auto redemptions. Multi-card appearance from "the" Bryce Harper- Refractor Prospect Auto and Triple Autographs featuring fellow Nationals Steve Strasburg and Ryan Zimmerman! 4 Bowman Platinum cards, 1 Chrome Prospect card per pack! 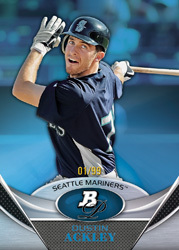 100 card base set featuring veterans and rookies and 100 prospect set featuring future baseballers. Gold, Ruby and Emerald base card parallels (non-chrome). Chrome Prospect Parallels - 1/1 SuperFractors and Printing Plates, Red Refactors (/5), new Gold Refractors (/50), Blue Refractors (/99) and Green Refractors (/399). Early prospect auto checklist includes: Jameson Taillon, Manny Machado, Christian Colon, Matt Harvey, Matt Lipka, Brandon Belt and other youngsters with talent. Veteran patch auto checklist includes: Evan Longoria, Clay Buchholz, Rick Porcello, Logan Morrison, Jason Heyward, Starlin Castro, Carl Crawford, Mike Stanton, Aroldis Chapman, Pedro Alvarez and a host of others that will be announced in the near future. Dual auto relics: Heyward-Freddie Freeman, Buchholz-Phil Hughes, Stanton-Domonic Brown, Madison Bumgarner-Buster Posey, Adrian Gonzalez-Crawford, Yovani Gallardo-Zack Greinke. Dual autos: Harper-Taillon, Machado-Colon, Mike Montgomery-Moustakas. Triple autos: Strasburg-Harper-Zimmerman, Heyward-Stanton-Brown, Posey-Brandon Belt-Gary Brown, Nick Markakis-Matt Hobgood-Machado, Taillon-Chapman-Shelby Miller, Machado-Colon-Grant Green. Hexagraphs (6 auto book cards):Longoria-Robinson Cano-Dustin Pedroia-Jeremy Hellickson-Jesus Montero-Jose Iglesias, Harper-Heyward-Stanton-Josh Hamilton-Justin Upton-Brown, Joey Votto-Justin Morneau-Kendry Morales-Miguel Cabrera-Ryan Howard-Gonzalez. 2011 BOWMAN PLATINUM HOBBY BASEBALL 12 BOX CASE MACHADO- HARPER AUTO? Good:This set is geared towards fans of chrome cards with a design that makes even the base cards look like refractor inserts. It lends itself to prospectors seeking autographs. The prospect autographed cards are indeed on card as most collectors prefer, although autographed relic cards are signed on stickers. The Gold, Green and Ruby Red parallels look especially great. Bad: The big knock on this year's set has to do with the checklist. Although Topps uses disclaimers, many collectors were furious when players on the early checklist weren't in the final product. Topps isn't safe from customer angst. Many were put off by the last-minute checklist changes and release delays. 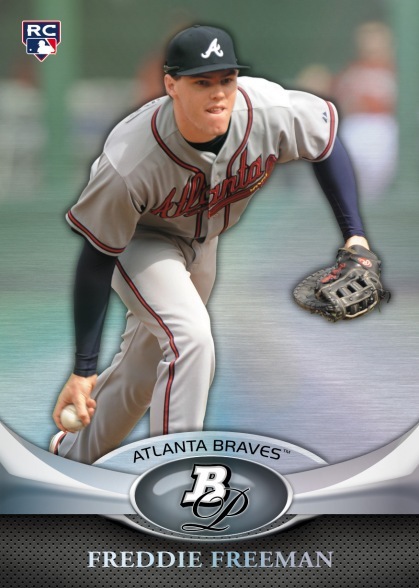 The Bottom Line: 2011 Bowman Platinum may look great to collectors, but for most enthusiasts what makes a product "good" is the final checklist. You'll be hard-pressed to find many who were happy with this year's set, mainly due to the uncertainty and changes leading up to the release. 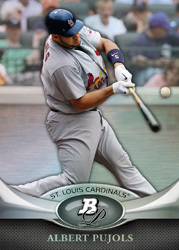 Sleek designs with a refractor finish make 2011 Bowman Platinum Baseball look great. The Ruby Red parallels really stand out among their Gold and Green counterparts. 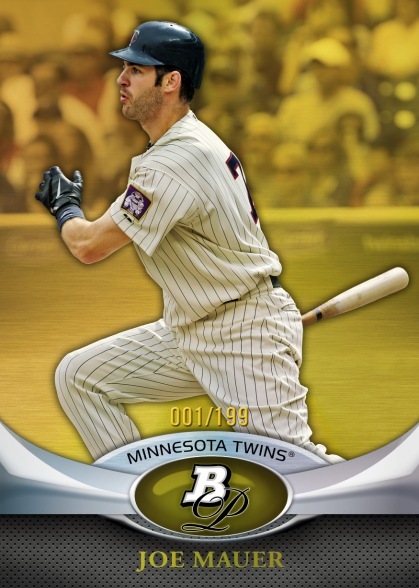 Last-minute checklist changes were the downfall to 2011 Bowman Platinum. Only the presence of a Bryce Harper autographed chase card and a few top prospects like Jameson Taillon give the checklist any thump. With one relic autograph and two prospect autographs per box, 2011 Bowman Platinum had the makings of a great value for prospect collectors. However, even the top players in the set aren't commanding the same secondary prices as other Bowman products. Some collectors complain about products that have too many inserts and parallels. 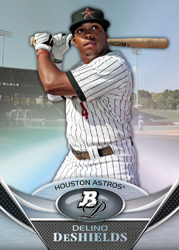 The opposite could be argued for 2011 Bowman Platinum as it doesn't provide enough variety. However, there is some fun to be had anticipating a Bryce Harper or a favorite prospect. GERRIT COLE ROOKIE (5) Lot 2011-12 TOPPS RC, BOWMAN PLATINUM + MORE ASTROS HOT! I think the cards look great!Being a “Chromie” I like the Chrome cards, they are crisp and clean with no noise backgrounds! Love it! And Thank you for the heads up on the 2011 Platinum! I’ll be sure to be looking for those when they hit the shelves! great cards !!! great pics!! Love it !! bought a box of 2011 Platinum and pulled the 001/399 green refractor auto of Harper..! !